This post examines how radiative forcing depends on CO2 concentrations in the atmosphere. In CO2 greenhouse demystified, we calculated the effective emission height where “thermal” photons escape to space . This height depends on the lapse rate temperature and defines the outgoing radiative flux for a given wavelength. By integrating over all lines in the CO2 15 micron band we were able to derive by how much the radiative flux reduced for a doubling of CO2. This “instantaneous” energy imbalance is usually called radiative forcing. Now we study how in detail how this radiative forcing depends on CO2 concentration. 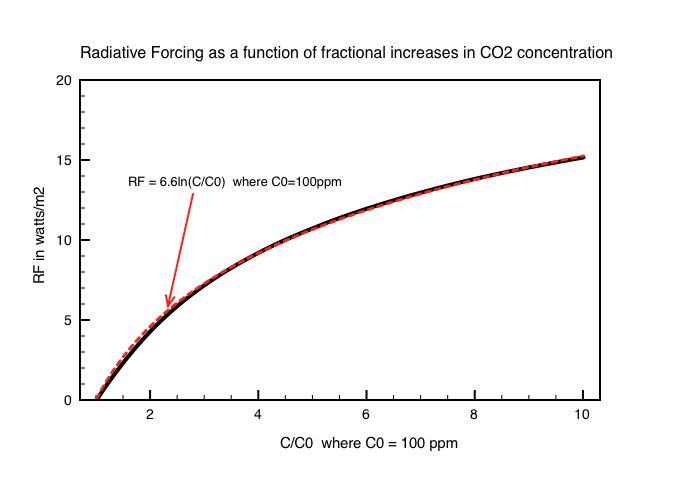 Figure 1 shows CO2 induced radiative forcing varies as a function of fractional concentration (C/C0), assuming a constant surface temperature of 288 K and a constant lapse rate. R.F = 6.6 log (C/C0) , where C is CO2 . We have derived the often quoted formula in climate science for the radiative forcing for a CO2 increase from concentration Co to C. This canonical equation is given by ~5.4 log (C/C0) ! OK so our result is about 20% higher – but that is pretty good IMHO, since the formula is never explained without reference to results from various GCM black boxes. Now we see here how it can be approximately derived just from changes to the emission height with increasing CO2. 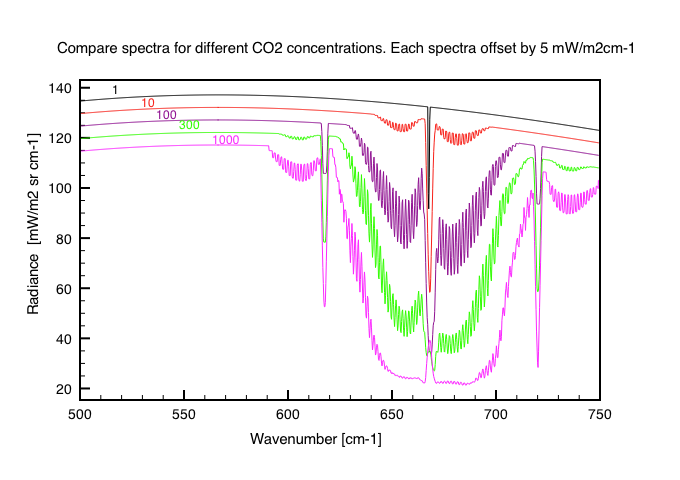 Figure 2 shows the Planck spectra for a range of concentrations showing how OLR reduces with increasing CO2 to produce this dependence. Fig 2. Change in outgoing IR spectra for a range of CO2 concentrations. Each increasing spectra has been offset by 5 mmW/m2sr-1cm-1 to better visualise the differences. Finally we can also make an estimate for the net change in surface temperature due to CO2. If we assume that each increment in forcing DS is offset by the same increase in Black Body radiation due to a small surface temperature rise DT, then we can iterate through long term increases in CO2 concentrations. The result is shown in Figure 3. 1. Modern levels of 300 ppm of CO2 have resulted in an average surface temperature ~ 4 deg.C higher than an atmosphere free of CO2. 2. A doubling of CO2 from 300 – 600 ppm results in a further ~1.5C increase in surface temperatures. Published results from more sophisticated GCMs reduce these figures by ~ 20%. This entry was posted in AGW, Climate Change, climate science, GCM, Physics, Science and tagged AGW, CO2, GCM, global warming. Bookmark the permalink. CB, I appreciate what you are doing with this series of posts, in providing an outsider’s sanity check. To me it seems much of the uncertainty is partitioning the marginal effects between radiative transfer for an atmospheric profile and how that atmospheric profile is modified by convective properties of the variable gases. These pieces don’t lock together tightly, and nothing appears to dominate. Yet they have to work together to balance the energy flows and approach some sort of steady state. Whenever this kind of coupling occurs, I have noticed that physicists like to use variational approaches ala Lagrange multipliers as a solution strategy. Attaching your radiative profile to their variational approach may be the missing link in narrowing down the uncertainty. We still may not know what the multipliers mean but it is something to consider. Thanks for the suggestion. I am going to study their paper. One interesting coincidence I found was that the CO2 radiative energy flux through the atmosphere seems to be maximised at exactly 300ppm. Too little and surface radiation takes over, too much and there is less radiative transfer upwards. It is almost as if the CO2 concentrations are driven to this value by thermodynamics. Hi Clive. The ‘modern level is 400ppm not 300ppm isn’t it? I think I was meaning modern as in mid 20th century ! The exercise was to understand the formula DS = 5.3ln(C/C0). I understand now how it arises. Of course there is also the assumption that nothing else changes. So for example that the lapse rate remains constant. If the lapse rate decreases the GHE also decreases. Thanks Clive. The assumption that ‘all other things remain equal’ is indeed a dangerous one. Miskolczi’s analysis of radiosonde data revealed that atmopheric opacity hardly varied over the period of record, despite the increase in airorne co2. In tracing the genesis of radiative forcing, it was affirming to find someone coming to the same conclusion, that the RF=5.3 ln(C/Co) “formula is never explained without reference to results from various GCM black boxes.” Is this still the case? In your March 1, 2013 reply to WebHubTelescope, you mention a maximum radiative flux through the atmosphere at 300 ppm. I don’t see that inflection appearing in any of the figures in your post. Has this been followed up anywhere? This could be a path to explaining the limitations of the logarithmic radiative forcing formula which predicts negative forcing for CO2 below any arbitrary CO2 reference value. Yes the formula RF = 5.3 ln(C/C0) is simply a fit made to the results of different GCM models where CO2 is increased and everything else is kept constant. The origin of this formula is a paper by Myhre et al. (see ref 1). I think it is avialable for free if you search on google. Forcing is logarithmic with CO2 because most of the central lines in the 15 micron absorption band are already saturated through out the troposphere. In the lower stratosphere temperature is constant with height so there is zero forcing. The central line actually gives negative forcing because temperature increases with height in the upper stratosphere so that MORE IR is radiated with increased CO2 – i.e. increased cooling ! The net positive forcing is due to the side lines in the main band increasing absorption reducing outgoing IR. The net result is a logarithmic increase as I was also able to prove above with my simple model. The maximum radiative heat loss due to CO2 from the atmosphere occurs at ~300ppm. That can’t be a coincidence. Why else should the natural level for CO2 at current temperatures on earth be 300ppm ? Why not 1000ppm ? 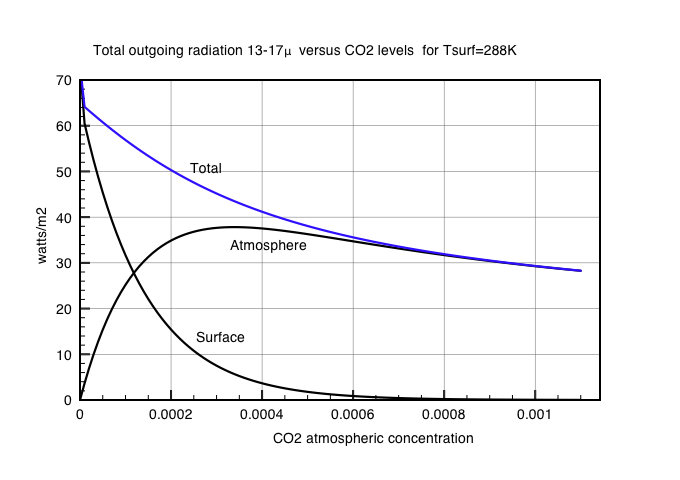 1) Clive, in your plot of OLR vs. CO2, Tsurf is going to vary as a function of CO2. What is the effect on your plot of taking this dependence into account, for climate sensitivities of (i) 1.0, (ii) 2.0, (iii) 3.0, (iv) 4.0? 2) Although CO2 has been hovering around 300 ppmv for the past two or three million years, that’s less than 0.1% of Earth’s life. Most of it has been spent at much higher CO2 levels, with the decline to the current level taking place during the 65 My of the Cenozoic Era. That said, an answer to 1) could conceivably show that your peak moves up as Tsurf increases, though it would be remarkable if your observation remained true over a wide range of Tsurf’s for some plausible sensitivity. One candidate for a regulator holding CO2 at 300 ppmv is plant life, which would appear to be the main consumer of CO2, lowering it by successfully sequestering it throughout the Cenozoic. This is a self-limiting process as plant life depends on CO2. During glaciations of the Quaternary, net global plant activity decreases allowing them to get by with CO2 down to 200 ppmv, but in the warm periods in between they need to allow the CO2 to rise in order not to starve themselves. All very hypothetical, but an alternative to the peak of your curve as an explanation of why 300 ppmv: if the plants lower CO2 any further they starve and the CO2 then rises back up, a regulating mechanism. At the start of the Cenozoic plants weren’t as demanding, but as their demands grew the CO2 decreased to the lowest feasible limit for type C3 plant life. Type C4 is a relatively recent innovation aimed at reducing dependence on CO2. As C4 takes hold we may find CO2 being pushed down below the Quaternary levels. However cold then becomes a limiting factor, and C4 may turn out to be useful for plants mainly as a niche innovation. Plants may have even figured this out already. All this could benefit from more equations. My understanding based on Houghton is that an atmosphere free of CO2 would result in the Earth behaving as a blackbody and using the “naked earth” model the temperature would be 32 C less than preindustrial temperatures. At the last glacial maximum CO2 was around 190 ppm and the earth was about 5 C colder than today. Now we are a little over double which would imply more than a 5 C temperature change since the long term average CO2 before 1750 was about 280 ppm for 8000 years and temperatures have only risen about 1 C since 1750. This would imply a 7 C response over the long term to a doubling of CO2. That would only be true of an atmosphere free of CO2 AND H2O. Water vapour covers a larger spectral range of the black body spectrum than CO2. Consequently it has a higher net GHE than CO2. The main CO2 absorption band on earth is 15 micron, The central lines are already saturated by 100ppm. CO2 forcing is logarithmic with concentration because it is only the smaller side bands which increase net absorption as CO2 rises. The total GHE of CO2 currently causes a 7C warming. The other 25C is due to H2O. The Ice age effect GHE cooling feedback was stronger because H2O levels fell as well as CO2. However the main effect was a reduction in high latitude solar radiation and a reduction in albedo due to large northern ice sheets. I’m not sure that I follow, and I would really appreciate if you, or anybody else, took the time to point me in the right direction. Is the 5,35ln(c/c0) the reduction in OLR given the change in concentration of co2??? If so, how does that translate into an analogue forcing at the surface? By a constant lapse rate?? Does a surface forcing demand a higher temperature somewhere in the atmosphere? Is the 5,35ln(c/c0) based on the assumption of 255k being the Earth black-body temperature? The term ‘radiative forcing’ is kind of confusing. I think it just refers to the instantaneous energy imbalance at the ‘Top of the Atmosphere’ following an instantaneous increase in CO2, assuming nothing else changes. Following any energy imbalance the surface & atmosphere react to restore balance. 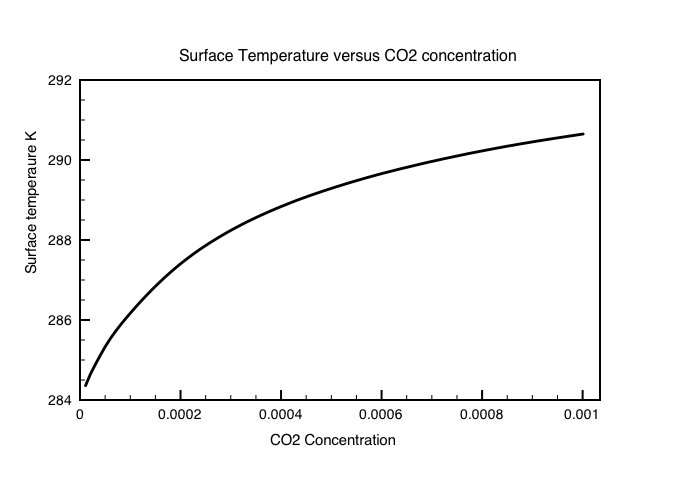 If you assume that the surface alone reacts then a warming of 1.1C would be enough for a doubling of CO2. A lapse rate is fundamental to the greenhouse effect. It is assumed that it remains constant in order to get the 5.3ln(c/c0) formula. In the real world however, the lapse rate will reduce with more evaporation – a negative feedback. However, more evaporation increases H2O – a positive feedback, and produce more clouds – a negative feedback All climate models have different responses for these feedback effects and they can’t all be right. For that reason the actual temperature response to a doubling of CO2 could be as low as 1C or as high as 4.5C. The data suggests it is no higher than 2.5C. I believe you have made a mistake in your energy balance equation. The Sun illuminates the disc of the Earth (radius RE), so the total energy of the Sun transmitted to the Earth is S * pi * RE^2 * ea, where ea is the absorption efficiency (0.7). However, the heat of the Earth is radiated into space over the whole warm area. If the entire Earth were uniformly heated to the same temperature, we would need to use its total surface area of 4 * pi * RE^2, so that he radiated heat would be : sigma * T^4 * er * 4 * pi * RE^2, where er is the radiation efficiency (a function of many things, including greenhouse gases). If the Earth did not rotate, and only radiated from a single hemisphere, the radiation area would be 2 * pi * RE^2. Probably the value should be ~3 * pi * RE^2, as the Earth is not evenly heated, but the night side is not terribly cold either. When you use these values, you will get a much reduced temperature effect from CO2.